Packed with fun, creative and multi-sensory activities, this resource will help children and teenagers with dyslexia become successful learners across the curriculum. 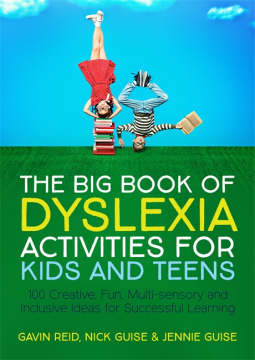 The authors provide over one hundred tried-and-tested fun and imaginative activities and ideas to unlock the learning of children and teenagers with dyslexia in creative ways. The book is split into parts addressing literacy, numeracy, learning and cross curricular subjects. With fun activities like 'Spelling Ping-Pong' and 'Class Got Talent', it focuses on key skills such as listening, memory, spelling, writing and key board skills. Each activity includes a 'red herring' that will keep dyslexic children and teenagers entertained, extending them in interesting ways that will appeal to those who think outside of the box. Brimming with imaginative ideas, The Big Book of Dyslexia Activities is an essential toolkit for any teacher or parent working with children and young people with dyslexia. Disclaimer: our family is brand new to the world of dyslexia, so I am still in the information gathering stage. My son's recent diagnosis wasn't a big surprise, but now I'm wondering what to do now that he has been formally diagnosed. This book offers 100 creative ideas to work on language and reading. Most of the activities are geared toward older learners, but I've already used a handful of ideas from this book with my second grader. The book is definitely geared more toward educators, but I've found it useful as a parent. The authors assume the reader already has a basic understanding of dyslexia and they jump right into the activities. I'm always looking for new ways to engage my child, who is easily frustrated and wary of educational games, but he has responded well so far. I can see myself coming back to this book as he grows.